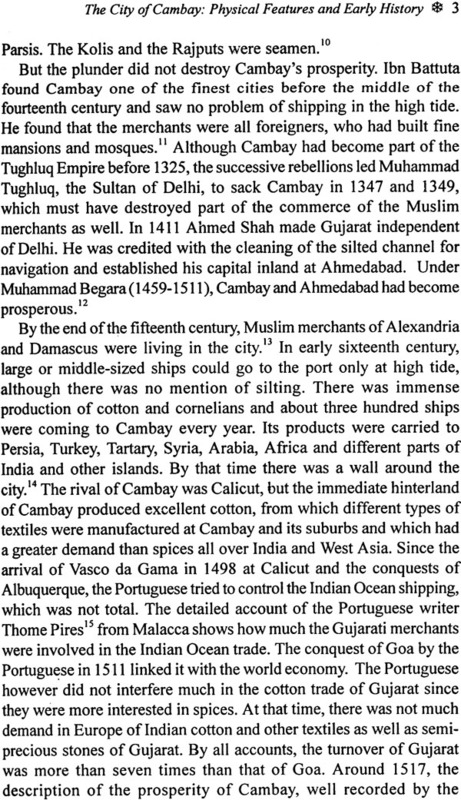 This monograph deals with the activities and attitude of the Marathas towards their sway over Cambay region in Gujarat from 1725 to 1825. 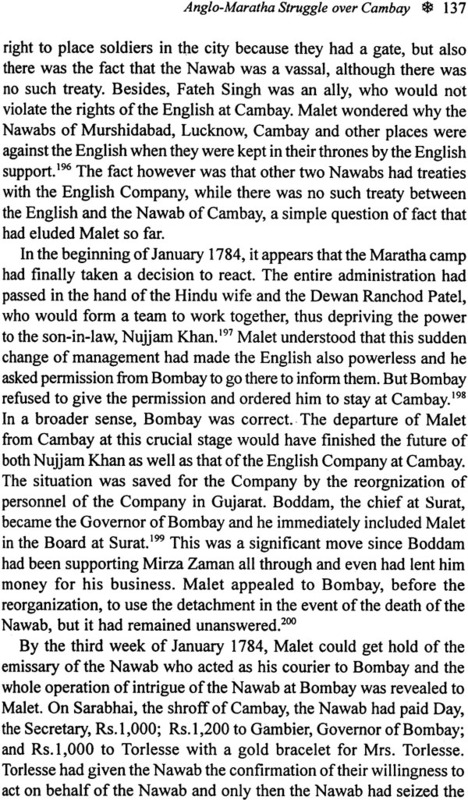 The narrative of the evolution of the Maratha policy at Cambay has been established here on the basis of contemporary published and unpublished correspondence of the English East Indian Company officials at Cambay, Surat and Bombay. 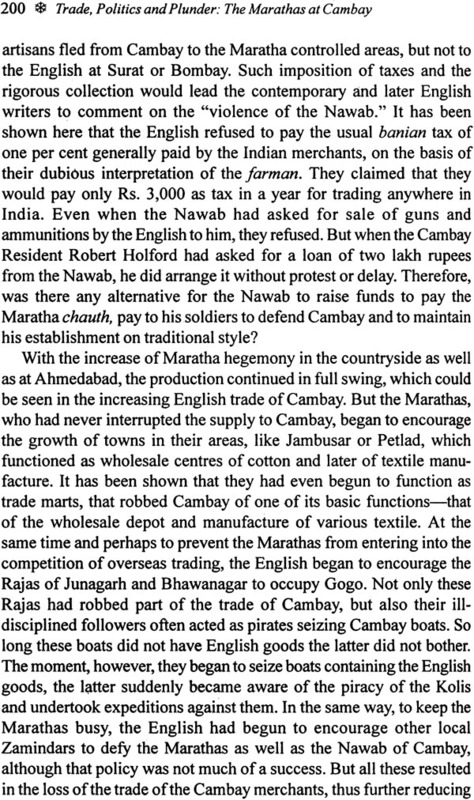 In doing so it deals with certain issues namely, the Maratha plunder in Gujarat and the resultant decline of the production in Gujarat leading to the decline of the ports of Surat and Cambay. 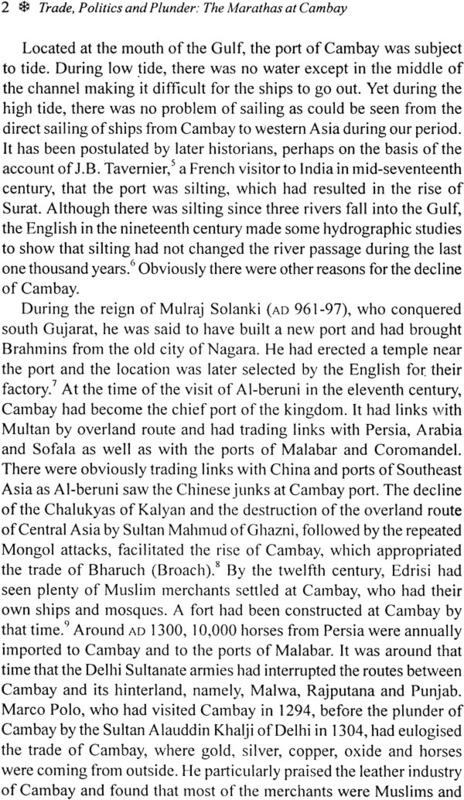 This monograph questions this assumption that the Maratha were responsible for the decline of Gujarat ports since it shows that the production in the countryside of Cambay, which was in the control of the Marathas from the middle of the 18th century, increased in which the English had profited most. 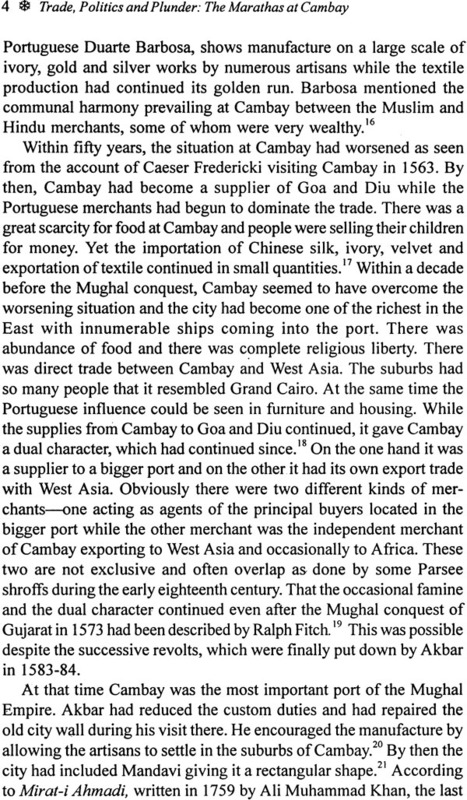 It also shows the Maratha policy of encouraging the growth of trade marts under their control and policy of toleration because of which the Arab merchants from Cambay flocked to the areas under the control of the Marathas. 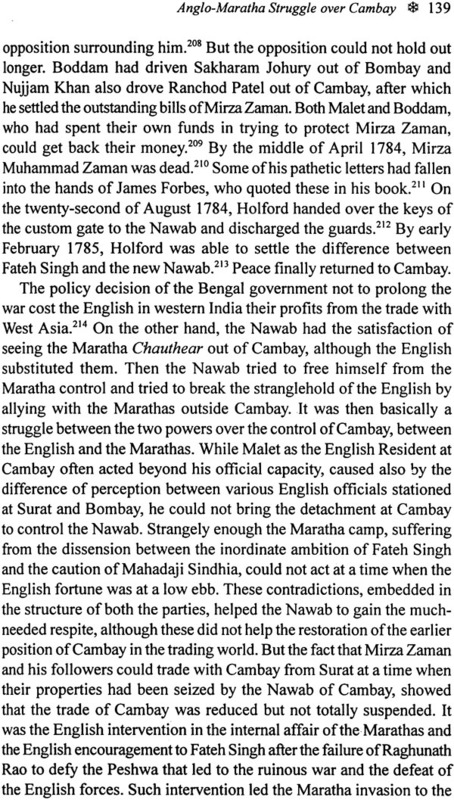 The so-called Violence of Nawab of Cambay, as termed by the contemporary English Residents was certainly there. 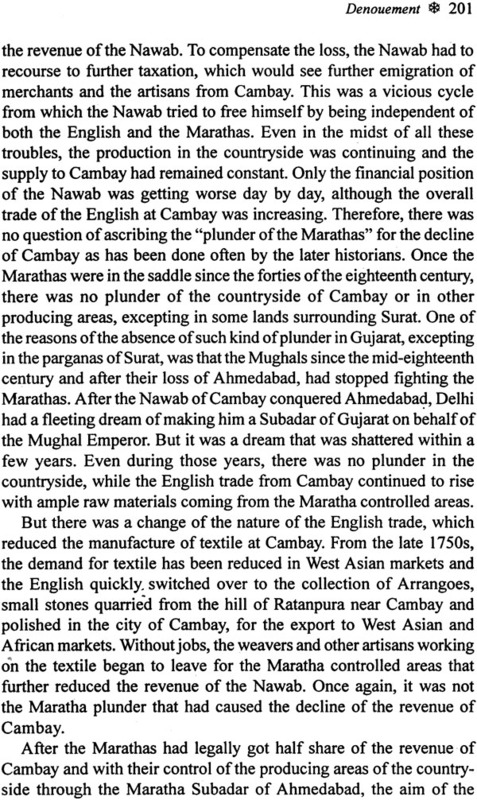 But as the monograph shows, the English were equally responsible for the decreasing financial condition of the Nawab that led him to impose fresh taxes leading to the desertion of weavers and merchants of Cambay, most of whom however had taken refuge with the Marathas than with the English at Surat or Bombay. 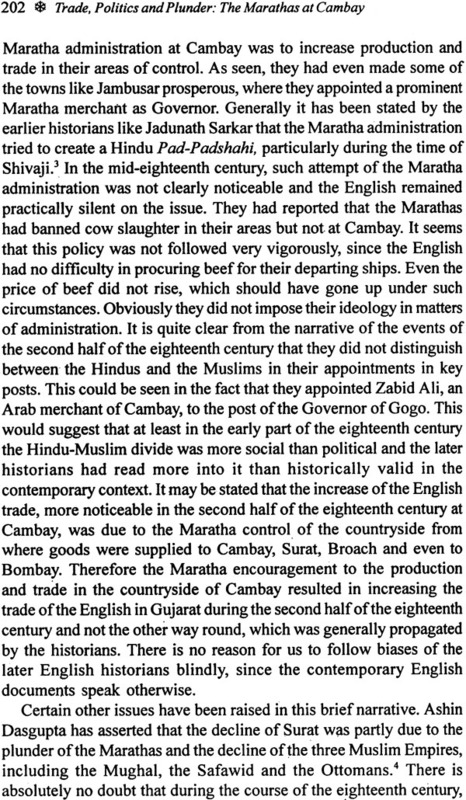 The sudden withdrawal of the Marathas from Cambay since 1784 and their defeat to the English in the early nineteenth century had also been narrated. 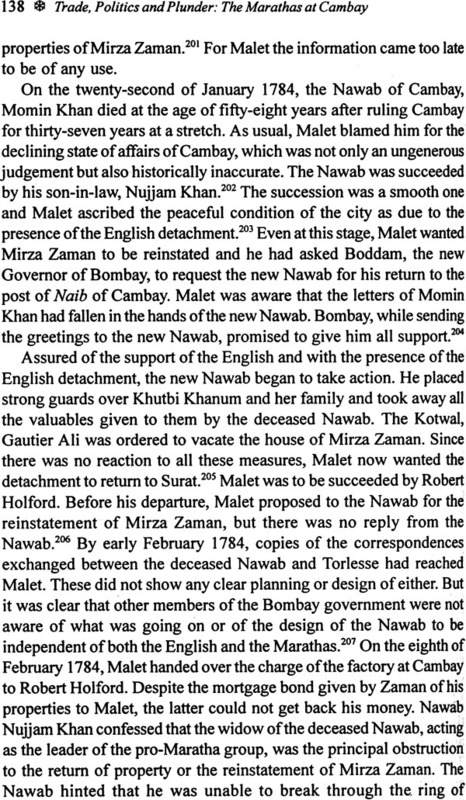 This period saw the gradual withdrawal of the English from Cambay and the emergence of the independent Nawab of Cambay. The question remains how far was he independent? 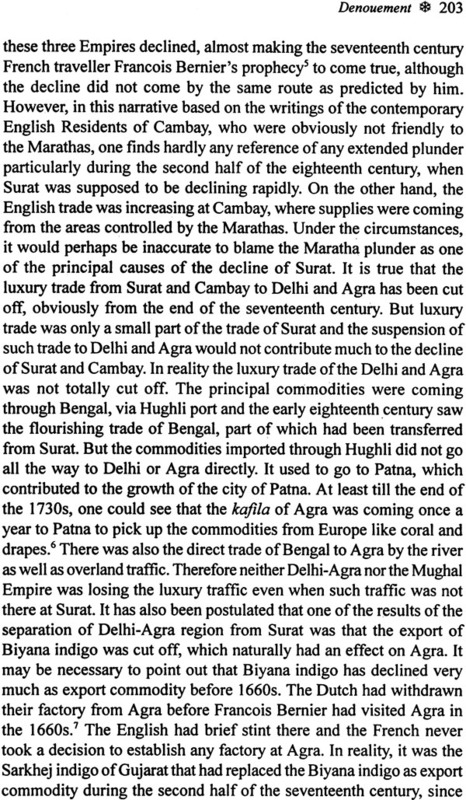 This monograph therefore brings the question of the decline of Surat and looks at the basic problem of the linkage between the decline of the Mughal Empire an the decline of Surat and Cambay. 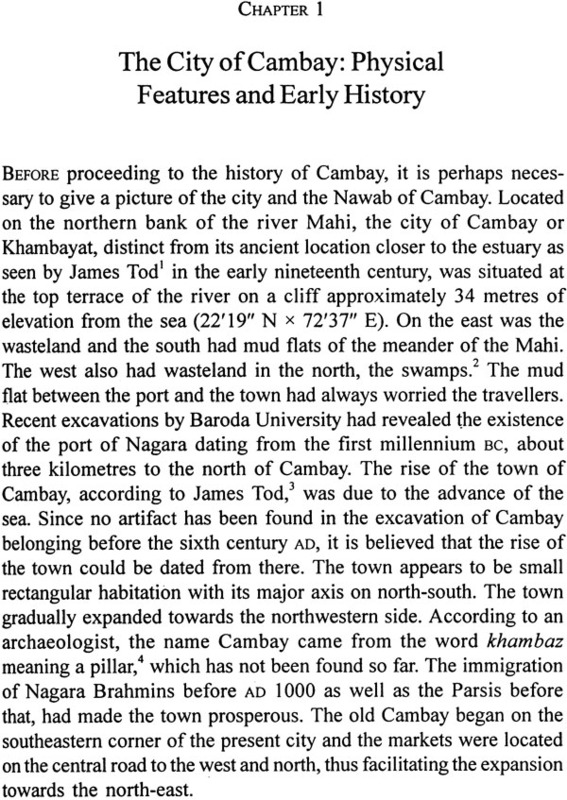 The monograph also negatives the view on the basis of hydrological studies undertaken by the English in the early nineteenth century of the increasing silting of the Cambay gulf, which has been supposed to be the reason of the decline of Cambay and the rise of Surat. He, retired Professor of Calcutta University, has published the following books namely, Foreign Biography of Shivaji (1977); some aspects of Mughal Administration (1984); Technology in Ancient and Medieval India (1986); The Rebel Nawab: Revolt of Vizier Ali Khan of Oudh (1990); Memories (1990); A History of Two Port Towns, 1500-1800 (1994); Murshidabad Affairs, 1821-1850 (1995); Adventures, Land Owners and Rebels: Bengal (1998), Tipu Sultan and his Age (2002); Transformation of Bihar; European Discourses (2003); and The Merchants and The State: the French in India, 1666-1739(2004). 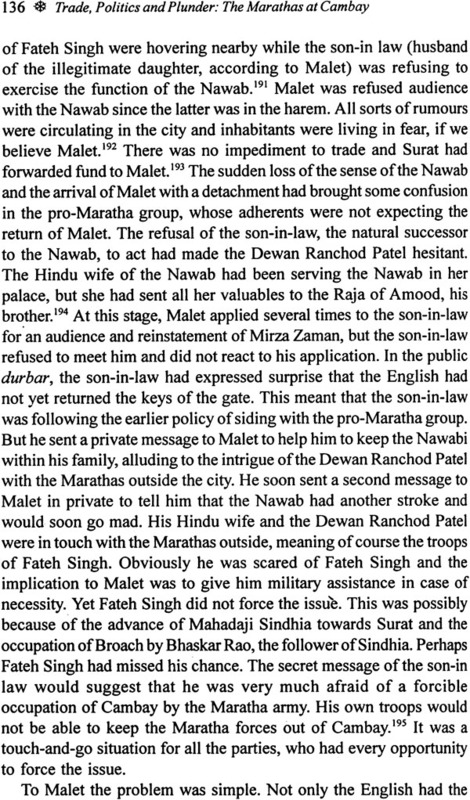 He was the Secretary of the Indian History Congress. He is at preset President of Paschim Banga Itihas Samsad, Kolkata and a member of the Council of the Asiatic Society, Kolkata. He has published nearly 200 papers in various journals of Europe, Canada, Bangladesh and India. He has also published several books on history in Bengali.